Could you run a successful business with your ex-partner? Most couples who get divorced want to get as far away from each other as quickly as possible. 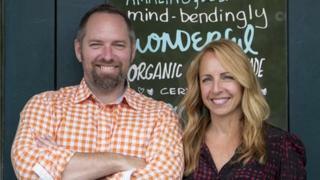 Joe Whinney and his ex-wife Debra Music decided to take a different path - they went into business together. Mr Whinney, 46, and Ms Music, 51, run Theo Chocolate. Based in Seattle, they make award-winning, organic, Fair Trade chocolate bars. Mr Whinney founded the company in 2006, and had no hesitation in bringing in his former spouse to look after sales and marketing. At that time they had been divorced for seven years following a five-year marriage. Mr Whinney, chief executive, says: "I asked Debra to help out part-time with sales while we were starting up the factory, because I knew that she wouldn't let anything fall through the cracks. I trust Debra completely, and as the company grew so did her responsibilities." He adds that while they still occasionally row, it has a positive outcome. "In so many ways we are totally different people. The tension created often leads to successful, passionate, and functional business practices. "During our most heated conflicts we both know that we are safe and that the outcome will work." Ms Music agrees, describing their working relationship as both "challenging and rewarding". "There can be friction between us, [but] at this point in the life of the company, and after much trial and error, we have learned how to ensure that friction generates creativity, innovation, and constructive dialogue," she says. Mr Whinney first became interested in high-quality chocolate when, as a young man in the late 1980s, he and a friend sailed from the US to Honduras and Belize in Central America. He agreed to volunteer for a small conservation foundation in the region, helping to harvest cocoa pods. "They handed me a shotgun and rice sacks," recalls Mr Whinney about his first day on the job. "I didn't know what I was supposed to do with either." However, he soon learned how to do the work, and also seeing first-hand how the business and social impact side of the chocolate industry were intertwined. Fast forward a few years, and now back in the US, Mr Whinney decided to become a cocoa broker, hoping to import high-quality cocoa at a fair price. So he wrote letters to 12 of the biggest US companies procuring cocoa beans at the time. One of the companies, Brooklyn-based CocoaLine, replied, and in 1993 Mr Whinney brought the first shipment of certified organic cocoa to the US. But he says he was still frustrated. He wanted to create his own chocolate company, one that went from "farm to bar", ensuring full transparency and fair wages for the farmers. And so the idea for Theo Chocolate was born. Today the company employs 95 people, and its chocolate bars and other products - which are all made at its base in Seattle - continue to grow in popularity across the US. Since 2011 Theo Chocolate has been sourcing half of its cocoa from the eastern regions of the Democratic Republic of Congo (DRC), an area that has been badly affected by conflict over the past two decades. The business's involvement in the DRC followed an unforeseen Hollywood encounter - Oscar-winning actor Ben Affleck got in touch with Theo Chocolate to see if it could help his charity, the Eastern Congo Initiative (ECI). ECI gives grants and support to community groups in the region, to help boost education, healthcare and economic development. Ms Music says they were not immediately sold on the idea of a partnership with a Hollywood star. "When Affleck came to our offices, we were vetting him as much as he was vetting us," she says. However, Ms Music and Mr Whinney were soon won over, and Theo Chocolate started to work with local Congolese growers to guide them on how best to farm cocoa, process it, and dry it, in order to meet international standards. And as importantly, Theo Chocolate agreed to buy their cocoa at prices twice the average paid by the biggest chocolate companies. Last year they bought 300 tonnes of cocoa from the region, all organic and Fair Trade. In addition to its economic boost, cocoa farming also benefits the environment of the DRC because the high-yielding crop does not have to be replanted, and prevents deforestation. As Theo Chocolate continues to grow, Mr Whinney and Ms Music have shown that a divorced couple can successfully run a business together. But how common is it? Not very, according to the experts. Glenn Muske, professor of entrepreneurship at North Dakota State University, says: "Few couples remain together in business after a divorce. Mostly one party buys the other out, or the business is sold entirely, or they simply close the doors." He adds that for a couple to successfully run a company together after divorce depends on a number of factors, ranging from what their work relationship was like before the break-up, how profitable the business was prior to the divorce, whether the divorce process went smoothly, and if both members bring a unique strength to the firm. He adds: "It is important that they each are able to release themselves from the [past] personal relationship, and focus on the business and the business relationship." Philip Way, a divorce lawyer for Mills & Reeve in Leeds in the UK, agrees that the divorced couple have to be able to put their emotions to one side. "It is obviously very dependent on what was the reason for the divorce in the first place," he says. "And then the couple have to think about how they will handle it emotionally when one or the other remarries. I certainly don't think every divorced couple can continue in business." Back at Theo Chocolate, both Ms Music and Mr Whinney have remarried. He says: "Just about every working day with Debra I remember why I married her, and why we are divorced. I made an amazing choice to bring her into my life."